You don't have to be a hostess extraordinaire to have a watch party at your house! One of my favorite weekends of the fall is OU/TX weekend! I went to the University of Oklahoma, so it's kind of a big deal! Red River Rivalry means that there will be a TON of visitors in Dallas this weekend, so if you're not a fan of crowds, it's a great weekend to stay home! ;) Just because you can't go to the game, doesn't mean you can't cheer on the Sooners in style! I teamed up with fellow Sooner, Brooke of One Small Blonde, to throw a brunch-themed watch party, and it was so fun! 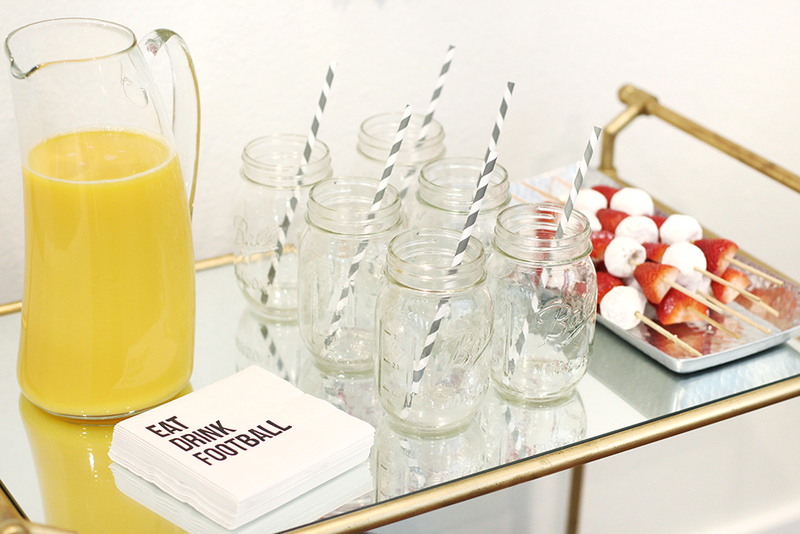 We used mostly what we had on-hand and bought these cute tailgate cups and football napkins. We used crimson paper fans that I already had to decorate our brunch table with OU's colors! First things first: set the mood on gameday with some BOOMER donuts! I love the donut letter trend right now and donut messages are a great way to incorporate your special occasion theme into your favorite breakfast treat! We started off with donuts and mimosas/orange juice on the bar cart- these donut hole and strawberry kabobs were so cute and delicious!